Compare Egg and Muffin Toasters: West Bend or Back to Basics? Egg and Muffin Toasters make it possible to prepare in just a few minutes a breakfast that includes cooked eggs and your favorite type of bread nicely toasted. And all at the same time! All you need to do is press a button and the eggs start cooking while the bread starts getting toasted. 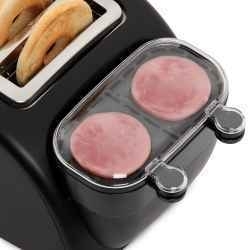 These toasters can also warm up ham, sausage or other cooked meats that you want to have with your breakfast. Egg and Muffin Toasters come in very handy in the morning as they save a lot of time and hassle preparing breakfast while you're rushing to get to work! Thanks to these toasters, there is no need anymore to get an egg mcmuffin at McDonald's before going to work! This review will compare different models of West Bend and Back to Basics egg and muffin toasters. These were the most popular among Amazon customers at the time this article was written. West Bend and Back to Basics Egg & Muffin Toasters: Basically the Same Product! Note that the West Bend egg and muffin toasters are also marketed under the brand name of Back to Basics. Back to Basics is a company that merged in 2007 with West Bend Housewares, but the merged companies still maintain their own brand names for some of the same products they market. There is simply no difference between the West Bend and Back to Basics egg and muffin toasters which come in 4-slice and 2-slice formats. This article will review and describe the West Bend and Back to Basics 4-slice and the 2-slice egg and muffin toasters. As it was explained above, the two brands West Band and Back to Basics refer to exactly the same product marketed under two different brand names. The best thing about this 4-slice egg and muffin toaster is that it allows you to make in just minutes perfect toasts and a quick breakfast for two people. The breakfast can include hard, soft or poached eggs, as well as warmed up breakfast meat such as sausage or ham. The 1800-watt unit has with four wide toasting slots as well as defrost and bagel functions. It is equipped with an 8-egg basket for hard or soft boiling eggs, two round egg poaching trays, and a meat warming tray. TOAST - Starts the toasting function only. EGG/TOAST - Starts the toasting and egg poaching/cooking functions together. Note that the bread will toast at the same time that the eggs cook. The machine will keep the bread slices in the slots to keep them warm until the eggs are ready, at which point the toasts will pop up. EGG - Starts the egg poaching/cooking function only. DEFROST - Adds about 30 seconds more to the selected browning control setting. 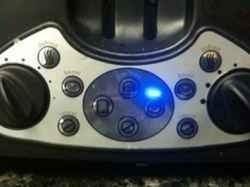 The BAGEL and DEFROST functions can be used together with the TOAST or EGG/TOAST functions. BAGEL - Toasts only one side of the bagel.. CANCEL ALL - Turns off both sides of the toaster during the cooking cycle. CANCEL - Turns off cooking or toasting for the corresponding side of the toaster. The unit is also equipped with light to dark toasting adjustment buttons, a crumb tray that slides out for easy cleaning, hidden cord storage, and the auto shut-off feature. The unit comes with a 1-year limited warranty. As mentioned, the West Bend and Back to Basics 2-slice egg & muffin toasters are the same product. The unit, shown in the picture on the right, provides the same features as the 4-slice model (see 4-slice model features listed above), but in a 2-slice format and with a single control panel. The 1200-watt unit is equipped with a 4-egg basket for hard or soft boiling eggs, a meat warming tray, a single egg poaching round tray, hidden cord storage, light to dark settings, and the auto shut-off feature. It also comes with a 1-year limited warranty. So which Egg and Muffin Toaster to get? Whether you are looking for a 4-slice or 2-slice egg and muffin toaster, because the same products are being marketed under the two different brand names (West Bend and Back to Basics), the answer to the above question becomes one related to just cost. And regarding cost, the lowest priced units are presently sold under the West Bend brand name. Given the low price of the West Bend toasters, they offer a surprisingly stylish design and a function rich control panel as described above. And most Amazon reviewers have been very happy with the results obtained with either the 4-slice or 2-slice toaster. These two toasters have received respectively an average of 4.5 and 4 stars (out of 5) from Amazon customer reviewers. Cooks eggs or meat on the non-stick griddle. Multi-functioning toaster oven bakes, toasts and reheats food.